The rise of online shopping and e-commerce has blown the retail world wide open. No longer is a well-run high street store the key to a successful retail business – in the modern marketplace, businesses must have a well-run high street store as well as a slickly maintained online presence. associated with online commerce makes it a valuable business asset, and something no modern restaurant can survive without. This is why ChefOnline has developed our ChefOnline platform, a website and mobile app designed to allow quick and easy takeaway online ordering. Our Restaurants online ordering systems also puts you in direct contact with a wide range of hungry consumers. We will help you to create an attractive and intuitively designed profile page for your restaurant or eatery. This page will not only help to drive your online traffic, but will also increase your word of mouth reputation and most importantly, boost your sales. The smartphone and tablet revolution has added a whole new dimension to e-commerce and online food ordering. A study from 2013 showed that around two-thirds of customers who order takeaway online now do so via a smartphone or mobile tablet device, and this number is only increasing. While smartphones and tablets do have fast online browsing capabilities, it is vital that businesses make the most of these devices by offering a mobile app. The same 2013 study showed that half of all restaurant customers surveyed had downloaded a restaurant branded app, while 55% had downloaded a restaurant review app. 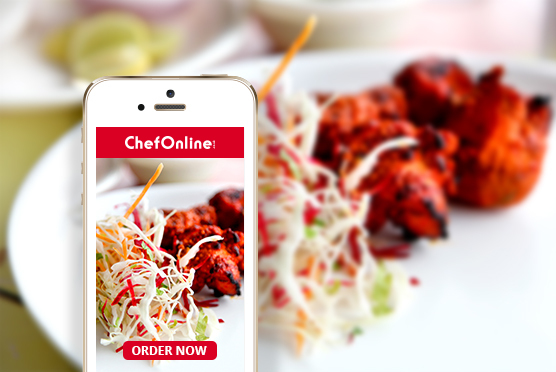 Our ChefOnline app enables quick and easy online ordering systems for restaurant customers, while also increasing your brand visibility and allowing business owners to access valuable feedback quickly and easily. The online restaurant marketplace will never be the same.